Home cinema fans had been eagerly awaiting the DVD release of these two blockbusters since the format’s inception, and their release marks a significant landmark in its development. The groundbreaking special effects are unsurprisingly a little less impressive than they once seemed, but they're only a small part of the mix, (especially with Jurassic Park, where the dinosaurs are on-screen for a remarkably short amount of time), and both films still work because their subject matter is so compelling. The DVD format is ideal for cherry-picking favourite scenes, once the limited appeal of their patchy linear narrative has been exhausted, allowing viewers instant access to the various thrilling demonstration-quality set pieces. Each disc comes complete with a number of appealing supplements, including lengthy behind the scenes documentaries, numerous storyboards, trailers and production art. 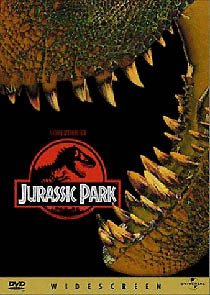 For dedicated fans there’s little new of interest on the Jurassic Park disc (the film is already well documented), but the Lost World disc is bulging with fresh material, including two deleted scenes and a brand new “Making of…” documentary. Most intriguing is the material (production sketches, storyboards, etc.) for two (sadly un-filmed) sequences where the humans are attacked by pterodactyls. Both films are available as DTS variants in the US, but with fewer extra features on offer. One of the deleted scenes on the UK Lost World disc (a fist fight in a bar, establishing Pete Postlethwaite’s character) has been cut by the BBFC by thirty-three seconds “in order to make the material suitable for its likely audience”. Since the cut was compulsory, the option to include the scene in its entirety and upgrade the certificate, (as was done with the recent Jaws disc, for example), was simply not available. The UK discs have outstanding animated menu screens, whereas the US versions are less elaborate. 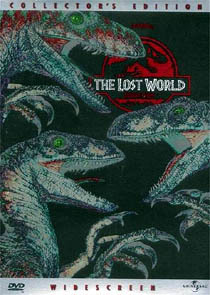 The US Lost World disc has a higher (448kbps) audio rate than the UK Region 2 versions (at 384kbps). The American Jurassic Park disc was not available for comparison.